I would be able to say more than these few words. I hope you have found some peace. This entry was posted in Family, Love, Memories, Unexplainable and tagged Death, Elizabeth Harper, Father's Day, Gifts Of The Journey, Loss, Peace. Bookmark the permalink. I remember Gene coming by my mom and dad’s house to pick up Jenny. Even as a teenager and not paying too much attention to “adults”, he would always say something to me and I remember that. He was a sweet soul! I remember spending the night at your house and your dad and Cullene always made me feel at home! After church this morning, we went over to mom and dad’s to eat lunch with them. It was a nice visit. I cherish those moments many of us take for granted. Those moments make our memories, so hold on to them! P.S. Happy Father’s Day to all the Dads! Create Memories! To all dads who love their children adn who love them, amen. A moving tribute, my post yesterday was a tribute to my dear departed Dad as well. My father and I are estranged for some obscure reason and have not spoken since a family funeral in 2001. It is something I think about often. His living in Thailand and not taking calls makes my efforts fruitless and disheartening – a loss is a loss whether living or not and your memories are precious. 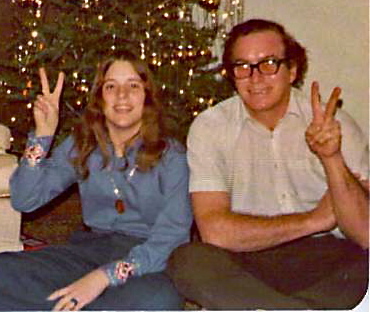 What was the young Karen Carpender doing under the Christmas tree with your Dad?